Already bored of the Grand Place and Manneken Pis? Then it’s time to head to the nearby historic upper part of Brussels known as Sablon. 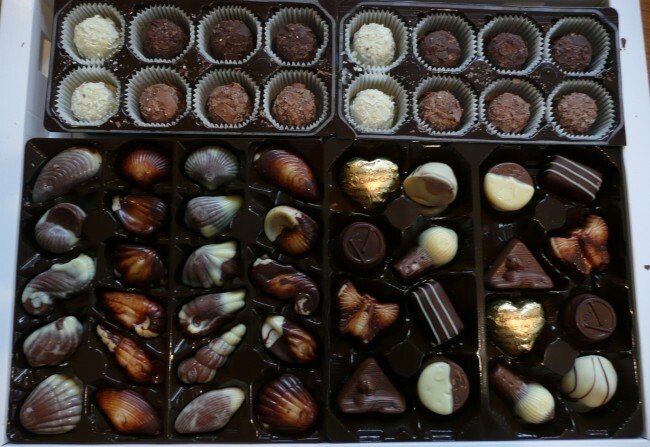 Visitors will find a Grand and Petit Sablon that are overflowing with antiques, Belgian chocolate and art. Every weekend, the Grand Sablon transforms into a market displaying a number of antique dealers and booksellers. Open two days per week, Saturday from 9 a.m. to 5 p.m. and Sunday 9 a.m. to 4 p.m., this marché des antiquaries is a must see if you want to feel the Belgian passion for pretty objects with soul. Although some objects may be expensive, you can still enjoy walking around the market or try your luck at bargaining for some precious treasures. If the weather is rainy, go to Rue des Minimes where you can find indoor antiques and African art shops. 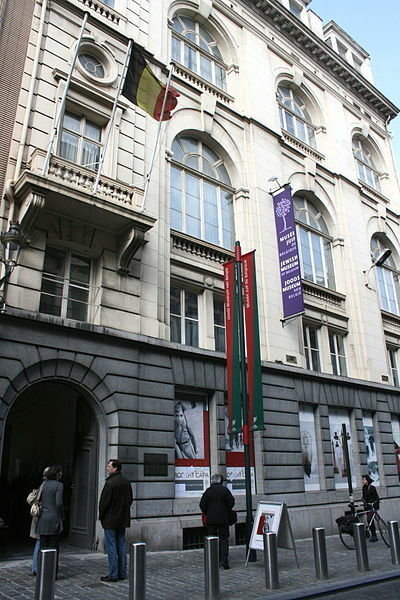 Belgium has the fourth largest Jewish community in Europe and is home to the prominent Jewish Museum. Located on the Rue des Minimes in a former 19th century town house, the main exhibition of the museum illustrates the life, history and culture of the Jews living in Belgium. Unfortunately, you have to be very patient to visit, as the museum is currently closed for renovation until 2017. However, there are some events taking place extra muros, which are updated regularly. Brussels’ gothic church from the 15th century now divides the two squares of the Sablon, the Grand Sablon and the Petit Sablon. According to legend, in 1348 Beatrijs Soetkens had a vision from the Virgin Mary telling her to steal a miraculous statue of the Madonna from the church in Antwerp and bring it over to the Sablon chapel in Brussels. Since then, the church has become a place for pilgrimage in Belgium, with an annual procession to honor the statue. In addition to religious services, Nôtre-Dame du Sablon also hosts classical music or organ concerts. Entry to the church is free. Belgium is known for its chocolate and there is no better place in Brussels to try its most popular brands. Marcolini, Godiva, Neuhaus, Wittamer and Leonidas line the streets of this square; prepare to get lost in this chocolate paradise. Enter Egmont Park either by Sablon or Avenue Louise and prepare to feel like Alice in the Wonderland. Carved out of the city, Egmont Park feels like a fairytale world: Yourcenar’s quote on the wall, fancy trees and best of all, a statue of Peter Pan! For the food connoisseurs there is a good news: the charming neo-classical Orangerie in Parc Egmont has now become a restaurant and their Sunday brunches are one of the best in town. The Egmont Palace, a mansion built in the 16th century, is also situated in the park. As part of the Belgian Ministry of Foreign Affairs since 1964 when Paul Henri Spaak convinced the government to acquire the building, this palace regularly hosts receptions and meetings for the Belgian government. 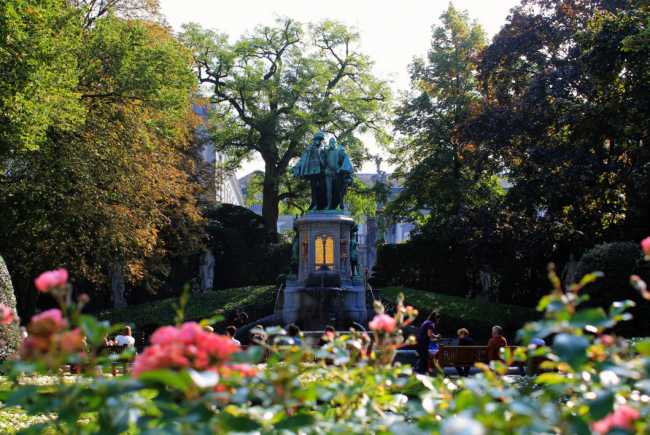 A lovely neo-Renaissance style garden situated between the rue de la Régence and Egmont’s Palace, the garden faces the Church of Our Blessed Lady of the Sablon. It is embellished with 19th-century Belgian artists’ sculptures. A fountain-statue on the back of the garden representing earls d’Egmont and the Hornes was sculpted in 1864 by Charles-Auguste Fraikin. 10 marble statues forming an arc represent lustrous, decapitated Belgian earls. These statues were all made by famous Belgian artists of the time such as Julien Dillens or Alphonse de Tombay. It’s a lovely spot to walk around and read a book, especially in the springtime. While exploring the area, you can’t miss the most crowded patio at Grand Sablon. L’Entrée des Artistes is a brasserie where you can eat and drink the Belgian way. The spot is quite touristic, but the view at Grand Sablon from the terrace is worth every penny. Opening Hours: Sun- Sat 11 a.m.- 11:30 p.m. In Sablon, chocolate stores interlace with dozens of modern art galleries, displaying a diversity of art in various and sometimes very strange forms. Whether your art preference is for sculpture, photography or collage, every modern and contemporary art lover should visit at least one of these galleries, such as Sorry we’re closed at Rue de la Régence. Opened in April 2005, this gallery presents its pieces of art in a white cube – a special project room. A majority of Grand Sablon’s galleries are taking part in the Brussels Art Square project, which aims to bring awareness to the history and art of the Sablon area. Pistolet is a typical Belgian round crispy bread with a soft core that is usually served for either breakfast or lunch. 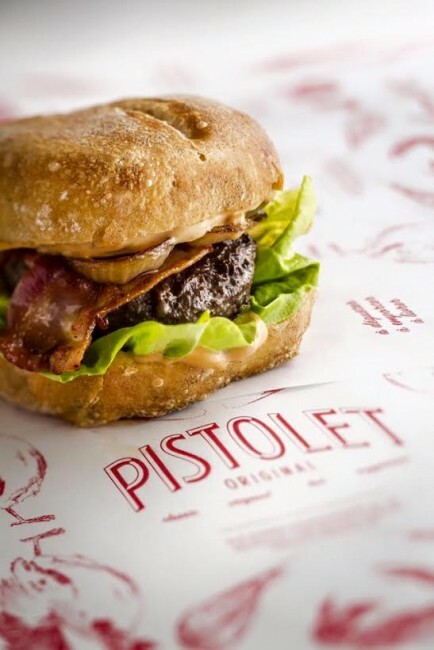 The fillings can vary as it could include either a vegetable, meat or jam; there is also the option to create your own at Pistolet. The origins of this strange name is most likely based on the country’s erstwhile currency – a few centuries ago for one pistole you could buy this delicacy. Other sources associate pistolet with a small weapon from the 15th century. Regardless of its origins, this treat is definitely worth a try. Opening Hours: Mon-Fri 9 a.m.- 4 p.m., weekends & holidays 9 a.m. – 6 p.m.
After traveling around the city, it is time to get a drink. Hortense Spirits and Cocktails is an amazing bar in the very center of Grand Sablon which offers a wide variety of unique and well-served cocktails accompanied with popcorn from a silver cup. 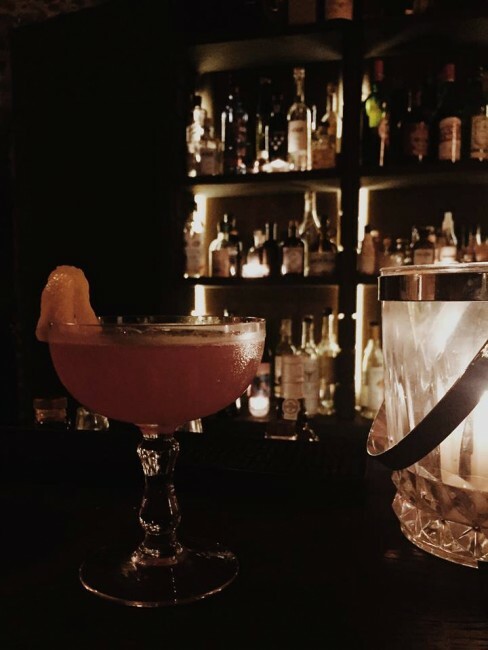 The menu is short and if you cannot find your perfect cocktail, the barman will rise to the challenge. Will you find this hidden spot? Hint: Look for the thimble. Opening Hours: Wed- Sun 7 p.m. – 1 a.m.